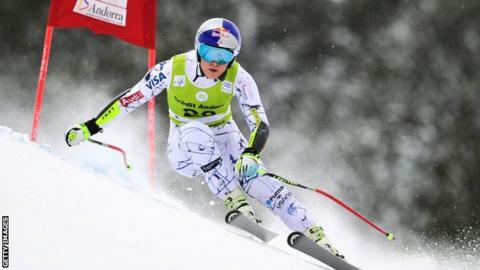 Lindsey Vonn raced with a hairline fracture of her knee but still managed to extend her World Cup lead in Andorra. The 31-year-old wore a brace on her left knee to protect an injury suffered in a crash on Saturday. Vonn set the fastest time in the super-G leg of the event on Sunday and finished 13th in the combined event. "No-one can ever call me a wimp," tweeted the American, who is seeking her fifth overall World Cup title. Vonn had fluid drained before deciding to start Sunday's event. She had the 23rd best time in the slalom leg of the combined but her closest rival for the overall trophy, Swiss Lara Gut, failed to finish. Vonn's advantage in the overall standings is now 28 points. "So the MRI shows a pretty substantial fracture in my tibial plateau," wrote Vonn on Instagram. "MCL looks decent as well as the rest of my knee. "Now I will talk to my trainers and make a plan."